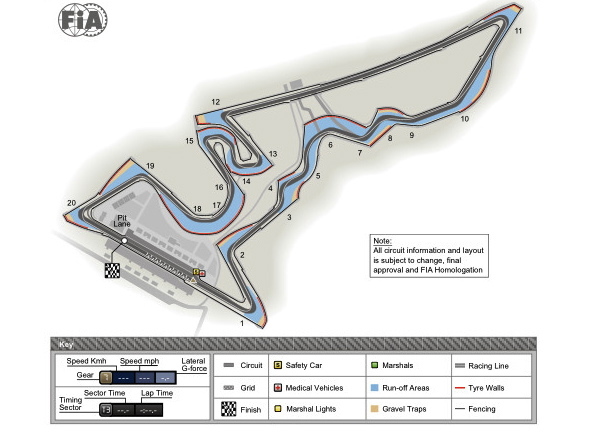 Circuit Of The Americas (COTA) is made up of 11 left and nine right hand turns. It is 3.4 miles long and is one of just five current Formula One circuits to run counter-clockwise, the others being Singapore, Korea, Abu Dhabi and the next and final Grand Prix in Brazil. Interestingly, all of these circuits are featured in the final seven-race stretch of the 2012 season. Nine U.S. circuits have previously hosted Grands Prix including Sebring (Florida), Riverside and Longbeach (California), Watkins Glen (New York), Phoenix (Arizona), Dallas (Texas), Detroit (Michigan), Las Vegas (Nevada) and, most recently in 2007, Indianapolis Motor Speedway. COTA's track surface took four months to lay and the third and final layer was completed in September and is comprised of aggregate from all over Texas. All told, it took over 640,000 cubic meters (22,600,000 cubic ft3) of material to construct the track. Race organizers are billing Turn 1 as the track's signature corner. From the start/finish line the pavement rises 133 feet before heading into a tight and blind, first-gear, left hand turn. Turns two and three pay tribute to the Senna ''S'' at Brazil's Interlagos. Turns four through six have been designed as an homage to the Maggots, Becketts, Chapel complex at Silverstone. COTA seems to be a mix of the best of many circuits. Other borrowed elements include a section, from Turns 12-14 that are reminiscent of Hockenheim's stadium section and the triple apex stretch through Turns 16 and 18 have been modeled after Istanbul Park's Turn 8. The first lap of the finished track was completed by U.S. racing great, Mario Andretti. In his 131-grands prix career, Andretti raced in 11 U.S. Grands Prix. Seven of those races were billed as the U.S. GP West and both were held in Las Vegas, but recorded just one win on home soil. That was at the USA West race at Long Beach in 1977 where, driving for Lotus, he finished ahead of Ferrari's Nikki Lauda and Wolf's Jody Scheckter. The last winner of a U.S. Grand Prix was Lewis Hamilton in 2007 during his rookie season with McLaren. Hamilton scored pole position at the Indianapolis Motor Speedway and the following day, he took his second career win only a week after winning the Canadian Grand Prix in Montreal. That 2007 U.S. GP at Indianapolis was notable for another reason as a second future World Champion made his debut that weekend- at only 19 years old, Sebastian Vettel replaced the injured Robert Kubica behind the wheel of a BMW Sauber. Vettel qualified in seventh position and finished eighth earning one point. In doing so, he became F1's youngest ever points scorer, a record he still holds. In recent times, Michael Schumacher, due to retire for a second time after next weeks Brazilian GP, has been the most successful driver at the U.S. GP. Between 2000-2007, Schumacher won five of the eight events, all at Indianapolis.